You want to drive a car, you have to pass a written test. How about passing a written test to own a gun? How about passing a shooting proficiency shooting range test? You want to drive a car, you have to carry liability insurance. How about carrying liability insurance to use a gun? You want to drive a car, you follow the rules of the road. a special license, CDL & motorcycle, for example. We all know driving and gun ownership are not the same thing. Cars and guns serve very different purposes in our lives, but both carry risks and both enjoy some level of legal protection. Wile the right to drive is one of our unenumerated rights, gun ownership is written directly into our Constitution. 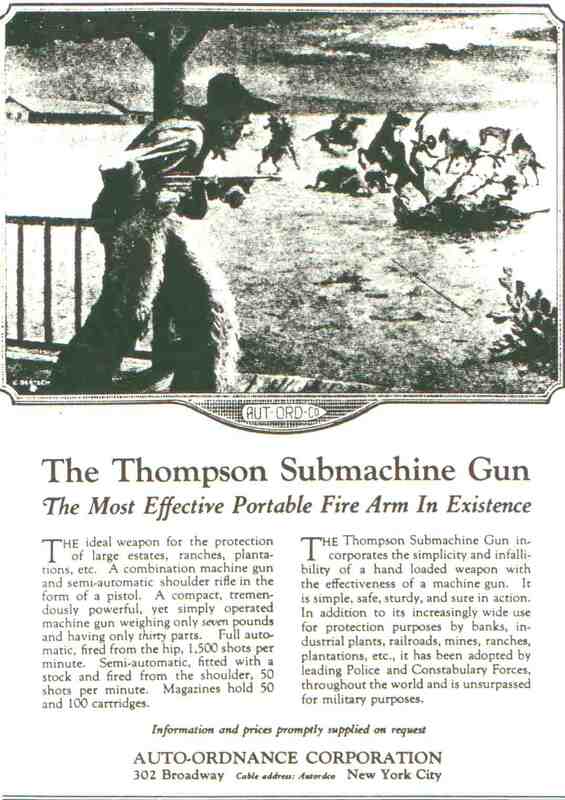 owning a Thomson sub-machine gun the same as owning a Remington Model 870 Wingmaster. There was a time when they were treated the same. Hell, back then you could buy the Thompson as easy as you could a BB-gun. It was decided that allowing automatic weapons in the general population was simply too dangerous, so we modified our fundamental right to own a gun with some rules. That is not to say you cannot own machine gun now, you can. All you have to do is obtain the pertinent federal license and follow the special rules that come with owning a weapon like a machine gun. In other words, to exorcise the fundamental right to own a machine gun, you must exorcise the fundamental responsibilities that come with it. Regulating driving a car aids in safe driving and promotes another fundamental right – to live. Regulating gun ownership is no different on that point. We recognize the differences between driving an 18-wheel semi tractor-trailer and a Toyota Prius by having regulations for each. All I ask is for gun ownership to be treated the same way. Does anyone really think owning weapons capable of killing dozens of fellow citizens in a minute is any less dangerous than a Tommy-gun? A lack of understanding our national history leads to erroneous debate surrounding the Second Amendment to the Constitution of the United States. Only by pealing back time does the correct view of its meaning take place. Regardless of how loudly either side in the argument (gun ownership rights vs. banning guns all together) screams, the Second Amendment’s meaning is what it was back in 1791, when the States ratified the Bill of Rights. Without question, the twenty-seven words of the Second Amendment are some of the most debated in American History. In retrospect, one may wonder why our Founding Fathers constructed an amendment with such an ambiguous meaning, but that is the point – it is not ambiguous. The text of the amendment reads, “A well regulated Militia, being necessary to the security of a free State, the right of the people to keep and bear Arms, shall not be infringed.” In reading the amendment, if taken in the context of 1791, its meaning is clear. Starting at the beginning, in May of 1607, England established its first permanent settlement in North America, Jamestown. From then until February 1912, with the statehood of Arizona, the colonies and Untied States, as a nation, had frontier territory contained within its boarders. Taking Alaska and Hawaii into account, the date moves to 1959. The term frontier implies a certain wildness and untamed nature. Even after statehood, vast areas within newly formed states remained untamed for years. Since Jamestown, and through the implementation of Manifest Destiny, the areas of America’s frontier changed, changing the needs of the citizens along with it. For instance, 1881 Washington, DC has more in common with today’s metropolitan areas than it did with the Western frontier town of Fort Sumner, New Mexico of its day. Two notable killings took place that year, one carried out by a county sheriff and his posse (a type of temporary militia used at the county and town level) the other,carried out by a lone gunman. The sheriff’s situation is well-known. He was Pat Garrett and his posse (the number of men in posse is hotly debated) hunted down Billy the Kid in Fort Sumner. Washington’s lone gunman has less notoriety, his name: Charles Guiteau. Guiteau surrendered to Washington police who arrested him for the assassination of President James Garfield. The point is, in the West, militias (posses) were commonly employed to answer specific needs while Washington counted on a police force. As settled areas become stable, and communities grow, the dangers faced by its citizens change. In Washington the need for a ready response of arms was no longer required, while in Fort Sumner existence itself depended on it. In respect to the Second Amendment, it is the dangerous nature of frontier land, which promoted the need of local militia. As settlements grew, displaced groups, like Native American, took exception to loosing land they lived on for years, if not centuries. Moreover, settlers gave little notice to treaties with tribal governments or boundaries of native lands, making hostilities inevitable. Before the American Revolution, the overall duty to protect citizens fell to the British Army. The size of the colonies made protection impossible. With its vast territory and over 3,000 miles distance from England, the American Colonies presented the British Army with a very large logistics problem. The Army’s primary concern was holding off encroachment of other nations, like France and Spain, into areas England claimed. This left far-flung settlements at the mercy of angry Native-Americans, as well as raiding parties of the other nations. Raising local militia solved the immediate assistance issue. At the outbreak of hostilities, a settlement’s government called out their militia. The unit was expected to meet the particular event and resolve it, or at least hold out until regular army troops arrived. It was a system of mutual benefit to the Crown Government as well as the colonists. The most famous militia organization was the Massachusetts Minutemen. The romantic view of this militia is farmers grabbing their guns and running to fight when called upon by the likes of Paul Revere. In truth, the Minutemen were a formal militia unit given a charter by the Massachusetts Provencal Congress in 1774. Every community supplied men for their local militia similar to the Minutemen, but all were under the control of some sort of civilian authority and not a rabble with bad intent. Some of the same militia units employed in support of regular British Army units before the American Revolution, later supported, if not enrolled in whole in the Continental Army under General George Washington. In fact, General Washington’s first experience in military affairs was as adjutant in charge of Virginia’s Southern District Militia. In this role, Washington inspected, mustered, and regulated the various companies of men. He later led Virginia’s Militia into the Ohio River region and briefly fought regular French troops and their Algonquin allies in the engagement that began the French-Indian War. After America’s independence from Great Britain, the new federal army faced the same logistical issues suffered by the British before them. Again, local militias formed to meet the need. Again, the various governments authorized and organized militia under local authority. One such organized unit was the First Regiment of the Chatham County Mailias, which served the Savannah, Georgia region. Shortly after the war in 1786, a group of runaway slaves, which fought with the British “refused to return to the service of their owners,” as a history of the time put it. No right-minded person could possible blame them. This group marauded and waylaid traffic along the Savannah River. Numbering over thee-hundred armed men, they were more than the normal civil authority (the county sheriff) could remotely handle. The First Regiment Militia, assisting regular army troops stationed at Beaufort, SC. routed the men from their encampment in the swamps along Bear Creek and restored order. As a side note, any society that chooses to enslave a large portion of its population is well advised to keep a sizable militia handy. In the end, during our initial development as a nation, individual states required the militia to maintain order. Rather than a position of sinecure, militia served, earned their pay (or received no pay at all) and often died in the process. It was left to the federal government to maintain a national army and to the states to maintain a self-policing force the national army called upon from time to time. That is what the Second Amendment is about, the ability of the individual states to maintain civil order and assist in national times of need. Standing armies are costly. Avoiding that level of public debt, states organized militia groups. While gun advocates point to the Second Amendment and claim the right of gun ownership, the Amendment does not interfere with each individual state’s ability to regulate the practice. In truth, it does not even require a state to allow gun ownership. It simply prevents the federal government from outlawing it. Unlike the First Amendment, the Second does not enumerate several different rights; it limits the authority of the federal government to interfere with individual states and citizens protecting themselves. One reason militia worked before and not now – the large variety of weapons available. Until the time of the Civil War, a man with a musket only needed a few pieces of flint, some bulk lead, and a supply of gunpowder. With the limited caliber of muskets, casting of balls was a simple process handled in the field camp; many men carried their own casts simplifying matters further. With the invention of cartridge style ammunition, supplies of pre-manufactured bullets for each type of weapon are required. Imagine the supply chain nightmare of supporting a unit in the field with a dozen or so different cartridges. Simply put, no longer can a government expect to supply ammunition to citizens bringing their own weapon to a fight; the variety is overwhelming. Today, the National Guard takes on the role the militias filled in years past. They are a hybrid of militia groups and a standing army. Fringe survivalist groups claim some tie-in to our historic militia groups, but they lack the charter and civil oversight to operate in the public interest. In the end, they are a bunch of guys with guns that challenge the civil authority, not work to protect the population at large. Mostly, the need to call men at a moments notice to man the parapets is gone. Organized militias, as intended by the Second Amendment, are simply of no practical use today. It is easy to get caught up in the rhetoric of organizations like the National Rifle Association and its focus on the later half of the amendment, the “right of the people to keep and bear Arms, shall not be infringed” portion. What they fail to acknowledge is the role the states play or the “A well regulated Militia, being necessary to the security of a free State” portion. Of course, the gun control fanatics are just as far off point, as the amendment does afford citizens the right to own a gun at the federal level and a state walks a fine line when they attempt to limit that right. What both groups fail to understand is we do not live in 1791 anymore nor is our society some utopia where we sit around a campfire and sing Kumbayah. Guns and gun related violence exist in our society today. It is true statement that outlawing citizens from owning guns leaves only the criminals with gun. It is equally true that improvements in firearm technology places in the hands of one individual the means to rapidly murder dozens of citizens. The tragic events at Virginia Tech come to mind. 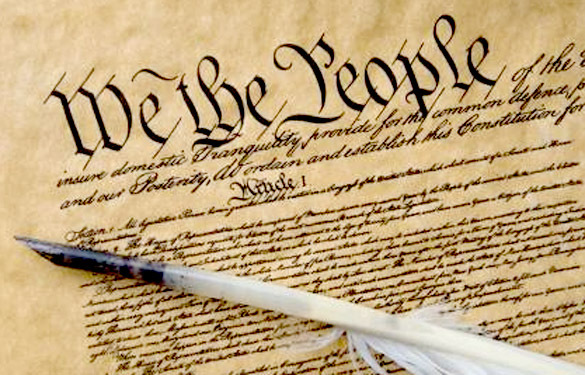 The Founding Fathers never intended our Constitution and the Bill of Rights to be static. After two-hundred and twenty years of development, both in society and technology, it is about time we revisit the Second Amendment and modify it to reflect the times today. Outlawing gun ownership is not any sort of answer, just as it’s not an answer to allow any nut with a diver’s license to own a bazooka. What we really need is to address the issue respecting various points of view and craft a new amendment that will serve the United States over the next two-hundred and twenty years. “The Constitution of the United States of America,” Amendment 2. GPO Access Home Page. Web. 22 Feb. 2011. <http://www.gpoaccess.gov/constitution/html/amdt2.html>. “Jamestown Settlement.” Official Jamestown Settlement & Yorktown Victory Center Visitor’s Site. Web. 22 Feb. 2011. <http://www.historyisfun.org/jamestown-settlement.htm>. “Billy the Kid.” Wikipedia, the Free Encyclopedia. Web. 22 Feb. 2011. <http://en.wikipedia.org/wiki/Billy_the_Kid#Death>. “Charles J. Guiteau.” Wikipedia, the Free Encyclopedia. Web. 22 Feb. 2011. <http://en.wikipedia.org/wiki/Charles_Guiteau#Assassination_of_Garfield>. Microsoft Encarta Encyclopedia Standard: 2004, Redmond, WA: Microsoft Corporation. “The French and Indian War.” Antique Prints And Maps From The Philadelphia Print Shop. Web. 22 Feb. 2011. <http://www.philaprintshop.com/frchintx.html>. Charles Jones, Jr. The Life and Services of the Honorable Maj. Gen. Samuel Elbert (Cambridge: The Riverside Press, 1887), SUPPLAMENTAL NOTES, 47. June, Early. “Virginia Tech Massacre.” Wikipedia, the Free Encyclopedia. Web. 22 Feb. 2011. <http://en.wikipedia.org/wiki/Virginia_Tech_massacre>. As Justice Tom C. Clark said in Mapp V Ohio, “Nothing can destroy a government more quickly than its failure to observe its own laws[i].” Of course, he was composing the majority opinion in the landmark case that forced individual states to exclude evidence obtained without a proper warrant. His warning goes far beyond the reaches of the Fourth Amendment[ii]. Everyone, at some point, find themselves in a situation wondering, “How did I get here?” It is easy to understand the consequences of a car wreck. Understanding the way a child from a “good” family ends up a delinquent may not be so apparent. We have to look to a series of events to truly understand the situation. It is the later example that illustrates the danger the United States faces with our moves ever closer to the tipping point since Justice Clark’s observations back in 1961. Over time, our freedoms, as citizens of the United States, have eroded. With small steps, a government that seeks to control the population rather than lead it diminishes each freedom held sacred. People often use the analogy of a pendulum swinging back and forth when talking about changes to our freedom. In other words, laws restricting freedom are passed, then over time, changed to restore freedom. This analogy is simplistic and misleading as restoring freedom always falls short of where it began. A better analogy is a “rising bottom[iii]” trend (Figure 1). Stock analysts us it to describe a company’s stock where the price is going up and down but the overall tend is up. The lowest price of a particular swing is higher than the lowest price of the swing before. In much the same way, our freedom swings from more restrictive to less restrictive and back again, but the overall tend is more restrictive. The restrictiveness of our law is more restrictive than its change before. Changes to the Fourth Amendment are prime examples of this theory. Since its adoption with the Bill of Rights[iv] in 1789, the Fourth Amendment has received over sixty[v] reviews by the Supreme Court, most within the last one-hundred years. It is understandable given criminals use it to try to get out of trouble and law enforcement pushes it to its limits trying to put criminals in prison. On its face, that level of review might seem like a good thing, but in reality, it makes for an unsettled situation where nobody understands just what the right covers anymore. Regardless, the overall trend is the cases limits the protection of every citizen and increases the power of state and federal governments to intrude in our lives. For example, in Mapp v Ohio, the case overturned because the police failed to obtain a search warrant and simply intruded into the home. Another case, United States v. Leon[vi], the court modified the ruling in Mapp saying the police can use evidence seized with an illegal or invalid search warrant, if they acted in good faith. The key being what constitutes good faith. In other words, if there is a mistake on a warrant or it is not specific enough, a judge can allow the evidence as long as the offices did not intend to violate the principles of the Fourth Amendment. Sort of a “trust me, would I lie about it?” statement from the police. While the Leon ruling does limit the protection granted in Mapp, the findings in the Arizona v. Evans (1995)[vii] and Herring v. United States (2009)[viii], in truth, blow it away. The Evans case found if the police obtain a warrant based of false information retained in police records, the search is valid. In Herring, the court further found if the police rely on false information provided by a different law enforcement agency a search is valid. The net effect being the police can simply allow data to remain active, even when it is not true or accurate and then later rely on that false data to obtain a warrant. In other words, it creates an atmosphere that encourages bad behavior by law enforcement with little or no recourse by citizens. For about 130-years the Fourth Amendment went without challenge. After that, the court muddled its meaning with weak and vague findings. In 1961, in the Mapp case, the court again place clear definitions on the amendment’s meaning only to have later cases again whittle away at our individual protection, just like the raising bottom chart illustrates. It is easy to side with the government and law enforcement as most of the people in these cases were trying to get away with some illegal activity. To do so is a mistake; supporting the erosion of our Fourth Amendment protections allows the persecution of individuals without the proper oversight of courts or a grand jury. Further, it allows and encourages an atmosphere of corruption within the various law enforcement agencies. By no means is this action restricted to the Fourth Amendment. Our freedom is under attack by the government our constitution seeks to limit. The government takes our freedom in little bites we hardly notice and justify it with claims of national interest and serving the greater good. We think of limitations, of the sort imposed after the terror attacks of 9/11, as temporary. The government sees them as a windfall and will be hard pressed to ever return them to us. This is the danger we face today. In a misguided effort to allow law enforcement to prosecute criminals, we encourage criminal behavior by law enforcement and give up our rights in the process. The time to stem the flow is now; waiting too long will lead to the anarchy Justice Brandies worried about. [i] Mapp v. Ohio. Section V. Supreme Court. 19 June 1961. FindLaw. FindLaw, a Thomson Reuters Business. Web. 2 Oct. 2010. <http://laws.findlaw.com/us/367/643.html>. [iii] “Rising Bottom Definition.” Investopedia.com – Your Source For Investing Education. Web. 02 Oct. 2010. <http://www.investopedia.com/terms/r/risingbottom.asp>. [iv] “Bill of Rights.” National Archives and Records Administration. Web. 02 Oct. 2010. <http://www.archives.gov/exhibits/charters/bill_of_rights.html>. [v] “MediaWiki Talk:United States Constitution/Amendment Four.” Wikipedia, the Free Encyclopedia. Web. 02 Oct. 2010. <http://en.wikipedia.org/wiki/Fourth_Amendment_to_the_United_States_Constitution>. [vi] “United States v. Leon.” LII | Legal Information Institute at Cornell Law School. 17 Jan. 1984. Web. 02 Oct. 2010. <http://www.law.cornell.edu/supct/html/historics/USSC_CR_0468_0897_ZX.html>. [vii] “Arizona v. Evans, 514 U.S. 1 (1995).” LII | Legal Information Institute at Cornell Law School. 07 Dec. 1994. Web. 02 Oct. 2010. <http://www.law.cornell.edu/supct/html/93-1660.ZS.html>. [viii] “Herring v. United States.” LII | Legal Information Institute at Cornell Law School. 07 Oct. 2008. Web. 02 Oct. 2010. <http://www.law.cornell.edu/supct/html/07-513.ZS.html>.